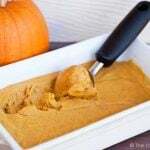 This delicious, clean eating pumpkin ice cream is dairy free and satisfies your pumpkin cravings! I love pumpkin. It’s just so versatile. There aren’t many other veggies that are so full of potential. Pumpkins can be anything from breakfast to dinner or dessert! You just can’t lose with pumpkin. And it’s so good for you! In fact, I would go so far as to say that this may be one of the most nutrient-dense ice creams on the planet! How’s that for being humble? Many of you know that a lot of my recipes for ice cream are banana based. Bananas offer a creamy texture that we are so used to in regular ice cream, but allow us to avoid the fat (for those who want lower fat eating plans) and even dairy for those who are sensitive. But the best part, is that you can significantly reduce the amount of sugar you have to add to get the level of sweetness you would expect from ice cream. I don’t know about you, but I’d much rather get my sugar intake from fruit than from a bag of sugar, even if it’s a bag of clean sugar. And while this does contain some maple syrup, it’s much less than you would have to add to regular ice cream. So that, in a nutshell, is why I keep doing these banana ice cream recipes. I will say that if you want to reduce the amount of maple syrup, I recommend switching to honey instead and using maybe 1/4 cup or so. The great thing is, you can adjust to taste after blending and before freezing! I have, however, gotten emails and facebook postings from people who dislike or are allergic to bananas. For those people, I highly recommend substituting the bananas with frozen mango. The flavor will be slightly different, but not so much so that it won’t still taste like pumpkin ice cream. Enjoy! This does freeze pretty hard. When removing it from the freezer, let it sit on the counter for a bit before trying to dig into it. Also, I went a little light on the spices, so if you prefer a stronger flavor, feel free to add more. That’s what is great about this recipe. You can taste it before you freeze it to adjust it to your own taste! Also, just because this has already been asked, yes… you can taste the bananas. There is no way around that. But again, adjust the flavor before freezing to something you enjoy. That being said, if you want to minimize the banana flavor, make sure you use just barely ripe bananas. Avoid bananas with any brown spots at all. If they have just finished turning from green to yellow, they are probably perfect. This Hamilton Beach Processor (affiliate link) is good quality and definitely the processor I will buy next time I’m in need of one! This dairy-free, vegan ice cream is an Autumn favorite. Serv in a homemade cone or with some graham cracker crumbles sprinkled over the top. Yum! Using a food processor, blend the bananas, pumpkin, maple syrup, and pumpkin spice thoroughly. Transfer to a freezer-safe container and freeze for 24 hours. What size pumpkin purée is needed for this recipe? Can’t wait to try it! Michelle – I’m not sure I understand the question. The recipe calls for 1 cup. Did you mean something else? One question – in the directions you say put all the listed ingredients in a food processor but you seem to have added another ingredients in the instructions (pumpkin) as well as pumpkin puree. Is that correct or a mistake? Does this freeze rock hard after 24 hours or maintain ice cream consistency? Melissa – It gets a little hard, but not rock hard. Just made this this morning. Delish! My 8yr old son said he doesn’t like pumpkin, I said just try it and he loved it! Nicole – Well it is a banana based ice cream. But a large part will depend on how ripe your bananas were. The riper they are, the more like banana the finished ice cream will taste. You can always double up on the recipe, but use not-so-ripe bananas to even out the flavor a bit. Unfortunately, the bananas were completely over-powering. I made sure to pick out EXTREMELY GREEN bananas and only had to use 2.5 with my cup of pumpkin. My family was disappointed that the pumpkin flavor was entirely lost. Erin – I’m so sorry! I’ll have to try the recipe again. The flavor in mine was perfect! It sounds like you want them to be extremely ripe (brown)- not green- right? Yes! Yes! Yes! I’ve pinned this to my Pumpkin Recipes board and I can’t wait to give it a try! Laurel – I’m glad you enjoyed it! Please tell me if we have to bake the pumpkin for the pure ore is raw? Deea – If you have a raw pumpkin, then yes. You need to cook it first and puree it. I used canned though. Whatever works best for you. I love pumpkin but it’s very hard to find canned pumpkin where I live….would butternut squash puréed work in this recipe? I’ve substituted butternut for pumpkin in other recipes, such as muffins/pie/etc….but never in a frozen recipe. Amanda – I don’t see why not, it should work just fine so long as it’s nicely pureed. Otherwise, it may be come a texture issue. Other than that, I’m sure it’ll work well. Love, love this! now stop me from eating the whole thing! will try the other ice cream recipes! I accidentally used the whole can of pumpkin:/ and had 5 over ripe bananas. It’s more orange than the picture but it’s sooooo tasty! I will try it again with underripe bananas next time to hide it from a friend that hates bananas;) where can I find your other banana based ice cream recipes? Courtny C – Most of my ice cream recipes are banana based. Just check my ice cream section under Desserts in the recipe index. If we do not have a food processor, how effective would a blender be? Lourdes – It could work, but you might have to work in smaller batches if your blender is not that big and be sure everything gets properly blended. A little more work, but totally doable. Thank you so much for this delicious treat. Just made it. Wish I knew about it earlier!!! Tastes wonderful! !! This was an awesome recipe…you can certainly taste the banana-but it’s an awesome combo nonetheless…i added some extra cinnamon which helped with the pumpkin pie flavor (in my opinion)…my three year old and one year old and going to town on the batch I just made…thank you for this recipe!!! Maybe the banana haters could try subbing avocado? Sadie – Hmmm. Not sure how the avocado would taste with the pumpkin spice though. But mango is supposed to be a really good sub for bananas. I’d have to play around with avocado to see what the flavors do. Tasha – Definitely reduce the initial freezing time to accommodate your own freezer. But beyond that, you could always try freezing this in ice cube trays. When you are ready to eat, simply pop them in a food processor to get it back to the proper consistency. Though you may need a little liquid initially so you don’t kill your processor. Any idea how long this would stay good in the freezer for after it is made? Or should all of it be eaten after the 24 hours of freezing time? Shelby – It didn’t last long around my house, but I’m guessing it would keep well up to about a week or two if it’s packaged well. Miah – Because if you put them in a processor when they are not frozen, all you get is mush. You can certainly try it, but I can’t say how it will turn out. Can you use reduced sugar maple syrup instead of pure maple syrup to reduce the sugar content? Being Diabetic I don’t want to use that much syrup. Love pumpkin and am always looking for new ways to use it. Made this yesterday and it was delicious. Thanks for sharing. This sounds so good, and I was wondering if agave nectar can be substituted for the maple syrup? Letty – Yes it can, but then it wouldn’t be clean. Don’t be shy with maple syrup. Because it is from just under the bark of the tree it absorbs nutrients from the sun and is very high in anti-oxidants! Love the banana peanut butter chocolate chip ice cream. 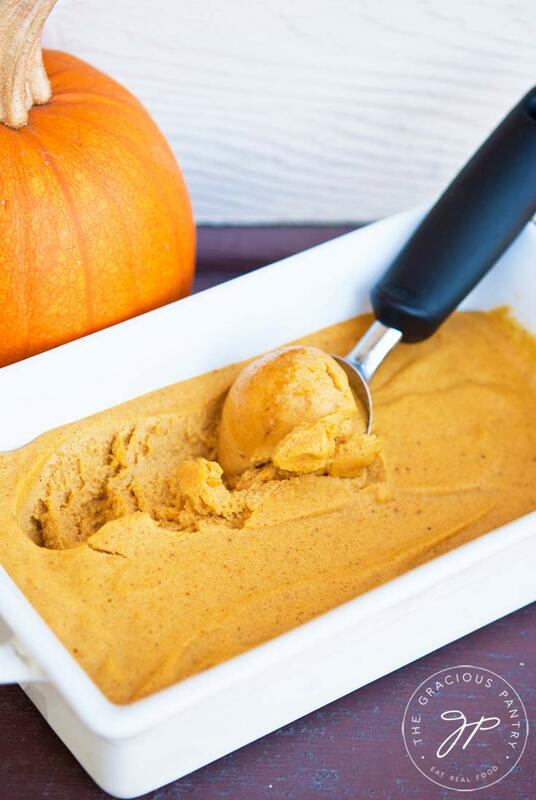 Can’t wait to make this pumpkin ice cream! I’m sorry, but you can’t call something ice cream if dairy cream isn’t part of the ingredients. It’s deceiving. This is actually a sorbet. That being said, I might actually try This. I am going to be trying this tomorrow. Unfortunately I don’t have a blender or processer, i wonder how well a mixer would work?? I also do not have a blender and use my mixer w/banana “ice cream” I have made before. Might have to let bananas soften like maybe 5 mins first and add 1-2 Tbls almond milk if you want to speed up process and make it creamy. Love, love, love it! Just made this as directed and yum!! Thanks for the recipe. It was super easy! Oh my gosh, you live up to your name, your answers ARE gracious! I seriously wanted to put a collender over some of the people’s heads and whap it with my wooden spoon! Thanks for sharing for free what brings you mirth and clean living. I was thinking about cutting out the added sugar all together to save calories. Has anyone tried this without using additional sweeteners? I have some very ripe bananas and usually the sweetness from that is enough in smoothies, however because of the pumpkin I don’t know if the bananas alone, no matter how ripe, will be enough. If anyone has done this without adding Maple Syrup or Honey can you let me know how it turned out? Thanks for sharing this recipe! I’m new to your blog and love what I have seen. Stephanie – That’s a good question. I have not tried it. Maybe make a half batch to give it a try? I can’t wait to try this! I know it says 6 servings but how big are the servings? I am trying to figure out how many batches I need to make for a family reunion this weekend. Sarah – I actually didn’t measure it that way. I just cut it into equal slices. Sorry. I wonder if using an avocado banana base would cut down the banana flavour? Anyone willing to give it a whirl? Connie – You could try it, or just use mango and make it more of a sorbet. I just wanted to say I think that if it doesn’t taste “Pumpkinny” enough you could try to swirl or top it off with some homemade pumpkin butter. This recipe sounds amazing… can’t wait to try it! Sherri – Absolutely! That would be delish! Followed the recipe as closely as I could remember it, but didn’t freeze the bananas. Tasted it before it went into the freezer, but I put it into a graham cracker crust for a frozen pumpkin ‘ice cream’ pie! SOOOOO GOOOOD! Pal – That’s so awesome!!! Wow! Stella – Sure! As long as there isn’t a ton of water in it, it should be fine. This sounds amazing! My husband and soon are allergic to fresh bananas. They’re fine if the bananas are cooked. Would cooking the bananas first ruin the texture? Stacey – Yes, because they need to be frozen. Unless you mean to cook them before freezing. But I have never cooked bananas like that before so it’s hard for me to say. Maybe try 1 banana and see how it holds up? Is there a way to lessen the sugar? 23gm is a lot for me. I have recently lost a good amount of weight by cutting my sugar intake. I love pumpkin and would love some low or no sugar ways to eat it. Tammi – You could try using stevia, but I’m not sure how it would turn out. Read about your devine ice-cream over at Life’s Hidden Treasures fb post. Sending some love your way as this ice-cream looks so yummy! Pinning! Susen – Thank you so much! Welcome! For those who don’t have a blender, cut up the bananas into slices. Put into large ziplock bag or glass bowl and only partially freeze. You can then easily mash with a fork or even by squishing the bag. My older son loves pumpkin pie….I bet he would live this! For those who don’t have a blender, cut up the bananas into slices. Put into large ziplock bag or glass bowl and only partially freeze. You can then easily mash with a fork or even by squishing the bag. My older son loves pumpkin pie….I bet he would love this! Lori – Do you typically eat clean? If not, clean foods may take some getting used to. Sorry you didn’t care for it. I love EVERYTHING pumpkin and/or banana! Can’t wait to try this. I can almost taste it now….. I made this and I cannot get the spoon through it.What can I do to soften it up? Joan – I mentioned that in my post above. Let it sit out on the counter for about 15 minutes or so before trying to spoon it out. It doesn’t have the fat in it that dairy provides. So it does get hard. Becky – Awesome! I hope you enjoy it! What do you think about using applesauce instead of bananas? I have apples coming out of my ears and looking for different things to use them for. Tausha – I don’t think it would be quite the same. But I do have a yummy recipe for apple butter. You can also freeze apple sauce as well as use it in baking. It’s a wonderful thing to have on hand! Many of my muffin recipes call for it. I am so excited to try this! Could you do it in a cuisinart ice cream maker instead of freezing it in a dish? I was thinking that would help with the hardness for scooping. Cynthia – I suppose it’s possible. I’ve never tried. If you try it, please let me know how it turns out! I’d love to know. Does it taste at all like bananas? I don’t like bananas but I understand the need for them as a thickener or whatever. Just wondering if there’s that hint of that flavor or if the pumpkin is strong enough to overpower. I definitely want to try this one!!! Can you substitute something else for the banana? Or does it still work without it? I can’t eat them. Lori – I mentioned that in my post above. The typical substitute for bananas is mango. I just made this today with these variations. 1 tsp. Cinnamon, 1/2 tsp cardamom, grated fresh nutmeg to taste. This will be a staple in my freezer! It is delicious and I did not find the bananas over whelming. Thank you for the recipe!! I just made this using some bananas that I had frozen for god only knows how long. I cut the recipe in half just to try it before fully committing. Texture was great! Mine does taste pretty banana-ish? Based on other comments I assume it is because they were SUPER ripe when I froze them initially. I’m thinking I’ll go buy myself some new bananas and try again. Either way – it is excellent! Thank you! Wandamarie – I haven not tried it that way, but it’s worth a shot! I would just make a small batch the first time to see if it works. Hi there! So excited to try this recipe. Quick question – can I use a blender instead of a food processor for this? Thanks! Alexandra – It might take a little more work to get it blended, but sure! Whatever gets it all blended together smoothly is fine. Just be careful because blenders tend to get stuck on frozen stuff a lot easier than processors. You may have to mix in a little of the pumpkin or even a little water to get it going without burning out your motor. I have been eating homemade banana ice cream for awhile now. I use a blender. I slice up the overripe bananas and freeze them. When I’m ready to make some ice cream, I let the frozen bananas thaw out, but not completely. I do add just a touch of almond milk to help mix it. I will add almond butter to mine at times. Yum. I like Tammi, have been watching my sugar intake and allow myself only 45 grams or less daily. The 23 grams of sugar per serving is too much for me so I will be doing something different for less sugar. Can’t wait to try the pumpkin puree! Carol – I hope you enjoy it! Hi. I did read through all the comments, so sorry if I missed this somewhere. What if I used two bananas and then some mango to replace the other two bananas? Do you think that would work, and if so how much mango should I use? Otherwise, if I totally replace the banana with mango, how much should I use? Should I just eye it to what looks like the equivalent of 4 bananas? Thanks! Kristin – In my experience, eyeballing it is best. But if you need measurements, 1 medium banana is approximately 3/4 to 1 cup. So that will give you a ballpark. Let me know how it turns out! I’m allergic to bananas, but this sounded so good it inspired me to try to make it anyway. I used equal parts pumpkin and full-fat coconut milk…. DELICIOUS and creamy! Meg – If you are allergic to bananas, mango is a good sub. Glad you liked it, I just hope you feel okay after eating it! This tasted good, but it really tasted like bananas much more than pumpkin. I’d change the proportions next time around. Leigh – Yes, I addressed this in the article above. I’m sorry you didn’t care for it. How many cups is the serving size? It call for 1/6 of recipe. Hattie – I don’t know. I made it and simply cut it into 6 pieces. I’m guessing about a cup, but I could be off on that. What is a serving size per cup/calories? I wasn’t able to measure before everybody dived into it. TK – I’m so glad you like it! 😀 To be honest, I never measured it. I had it in the dish pictured and just cut it into 6 pieces. I’ll measure it next time I make it. Made it for Thanksgiving tody and big hit! Did make a few alteration though: doubled pumpkin, pur all ingredients in Vitamix at room temp then in refrigerator for a couple hours before pouring in ice cream maker. Great texture and taste. This looks amazing! I just happen to have some pumpkin…this is happening very soon. Sarah – I hope you enjoy it! Do you know the Dietary info on this? Mary – I no longer offer nutrition data. You would have to enter the recipe into an online calculator. MyFitnessPal.com has an easy one. Loved this! I’m such a pumpkin fiend in the fall, this helped greatly. mostly healthy too so I don’t feel guilty chowing down. mine tasted a bit too much banana to my liking. I’m going to add more pumpkin and less banana next time to my preference 🙂 still delish however! my freezer is super powerful for some reason. it took a day to freeze and 2 hours to thaw enough to eat it haha. PumpkinFiend – Oh no!! That’s one powerful freezer!! ???? Just found this recipe via Pinterest, and I’m super interested! I’m weird and don’t love the flavor of maple syrup, though. All the comments I’ve looked at mention more about tasting banana, which is fine with me. My question is can you taste the maple syrup, or is that flavor lost/blended in enough that I won’t notice it? Or would you recommend using honey or something else to sweeten it if maple isn’t my jam? Thanks! Erica – You could definitely sub with honey, but you may want to back off a bit because honey tends to taste sweeter than maple syrup. You’ll have to experiment. I didn’t taste maple syrup, but I enjoy the flavor. So I may not have noticed the way you would. Absolutely Devine! How many calories is this ice cream? Sarah – I don’t offer nutrition data due to liability. But MyFitnessPal.com has a great calculator that will import the recipe for you just by pasting the url into it. Very excited to try this! Can I make it using an ice cream maker? If I do, can I then use room temperature bananas and skip the freezing step? Amy – Sorry, no. This isn’t formulated for an ice cream maker. Can I substitute honey for the maple syrup? Wow! This is great! I want to make all of my ice cream this way! Yum!! I ended up adding a little more pumpkin pie spice plus extra cinnamon and a drizzle of real vanilla extract, and boy is it good! What a great simple and healthy dessert recipe! Do you think I could cut back on the sugar is I use homemade pumpkin puree? Bethany – I doubt it. The pumpkin puree you buy at the store is the same as what you would make at home. You could cut back on the bananas a bit, but I’m not sure what that would do to the overall structure of the finished ice cream. I have been making your all-fruit “ice cream” for over a year now, and I enjoy it so, so much! Today I had the thought of doing some kind of pumpkin + frozen banana ice cream and was just about to do some experimenting when I decided to look on Pinterest first. And what should I hit straight away? The Gracious Pantry pumpkin banana ice cream! You beat me to it! 🙂 I can’t wait to try it out tonight (since I always have loads of frozen bananas on hand anyway)! P.S. Thank you for your wonderful recipes! Your banana/strawberry/pineapple ice cream has been an essential player in my weight-loss and overall health journey. So delicious and wholesome! Sara – What a wonderful comment! Thank you! 😀 Please let me know how it turns out for you! Thanks for your site. I made a heavily modified version of this recipe for a Thanksgiving gathering yesterday and it was a huge hit. I was experimenting while making it so I’m not exactly sure of my recipe. It had far more pumpkin than banana, probably 3 or 4 cups puree combined with 4 or 5 bananas and 1/2 cup maple syrup. I also added 1/2 t freshly grated nutmeg, 2 t cardamon, and 1 t cinnamon. After blending, I added about 2 tablespoons of minced candied ginger that was soaked in warm rum to soften it and bring out the flavors. Before serving, I topped it with shelled pumpkin seeds. Is this safe for dog consumption? Janice – I have no idea. I would avoid it unless a qualified veterinarian tells you it’s okay. Can honey be used instead of maple syrup ? Nutritional values for this? And serving size? Teresa – You would have to enter the recipe into a recipe calculator. I highly recommend MyFitnessPal.com. They make it very easy to calculate recipes. Can you use a blender for this instead? Nicole – You can try, but you’ll have to be very careful adding the bananas. They can burn out your motor if you don’t add them slowly and with other ingredients. Sylvia – You can try making it in small batches in a blender. But take it slow and keep the amount of bananas small or you run the risk of burning out your motor. I made this over the weekend and it was delicious! For those who have a Ninja processor, it’s not the best machine for getting your bananas completely smooth before you mix them with the rest of the ingredients. I got the bananas about 80% there and then scooped it out and layered the pumpkin/maple syrup/spice mix with the bananas back into the processor. That helped get the rest of the small lumps in the bananas out. MMMMMM! Thank you bunches!!! I can’t eat dairy, so this is wonderful. Can you use honey instead of syrup? Thanks, this looks yummy! Would using honey instead of syrup work? Savannah – Yes, but the honey flavor would really come through. It’s also a bit sweeter than maple, so you may want to use a bit less than the recipe calls for.